Confused about Debt and Deficit? With so much worry about the growing size of the UK National Debt, as well as the debt of many of the world’s other leading economies, the words debt and deficit have been thrown around a lot in the media lately. Politicians use these terms to try and justify how well they are performing with the economy, or how poorly the opposing side is performing. 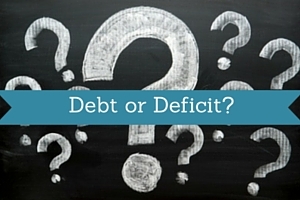 Often times, though, it can be a little confusing wrapping your head around what these terms actually mean and also what the difference between debt and deficit is. Here we’ll briefly explain – as simply as possible – the difference between debt and deficit, so that the next time someone in authority tries to convince you that they are doing a good job at managing the economy, you’ll be able to judge for yourself whether they are telling the truth or not. The word ‘deficit’ simply refers to the process of regularly spending more money than you have coming in. Let’s say that you have a monthly income of £1500 for example, but each and every month you tend to spend more like £1700, funding the £200 shortfall through the use of a credit card. In this scenario, you are ‘running a deficit’ of £200 per month. If we stick with the same example that we just used to explain the term ‘deficit’, the word ‘debt’ refers to the total amount of money that you owe to the credit card company because you are constantly running a deficit. Each month, the amount you owe increases by £200 (remembering the above example), because you are consistently overspending. So, if you were to run a £200 deficit for 12 months, you would end up building up a total debt of £2400, plus any interest which has accumulated on that debt during the period. Another term we should consider here is that of ‘running a surplus’. Running a surplus is the exact opposite of running a deficit. If you earn £1500 per month for example, but you only regularly spend £1300 per month, then you are running a £200 per month surplus. This surplus could then be put into a Stocks and Shares ISA, invested in some other way, or, if you have any outstanding debt, then you could start to pay that debt down each month. This is why we constantly hear politicians saying that they want to bring down the deficit in order to deal with the national debt. Really, though, if we want to reduce the amount of debt we have on a national level, we need to be running a surplus, meaning that we are spending less as a country than we are bringing in through taxation and other means. This explains why the national debt of the UK is continually increasing, even though the government claims to have reduced the deficit. The deficit may be lower than it was, but we are still overspending massively as a nation, and the national debt therefore continues to rise. Hopefully this has given you a little more insight into what the difference is between debt and deficit and how this affects not only your own finances, but also the finances of a nation. Now that you know the difference, you’ll be able to make a more accurate judgement as to how well the economy of your own country is being run. Want to pay off your debt? Why a Little Means a Lot!